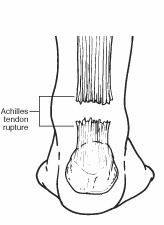 An Achilles tendon tear is a complete or partial injury that occurs when the tendon is stretched beyond its capacity. Forceful jumping or pivoting, or sudden accelerations of running, can overstretch the tendon and cause a tear. An injury to the tendon can also result from falling or tripping. Achilles tendon tear is most often seen in “weekend warriors”—typically, middle-aged people participating in sports in their spare time. Less commonly, illness or medications, such as steroids or certain antibiotics, may weaken the tendon and contribute to ruptures. In diagnosing an Achilles tendon tear, the foot and ankle surgeon will ask questions about how and when the injury occurred and whether the patient has previously injured the tendon or experienced similar symptoms. The surgeon will examine the foot and ankle, feeling for a defect in the tendon that suggests a tear. Range of motion and muscle strength will be evaluated and compared to the uninjured foot and ankle. 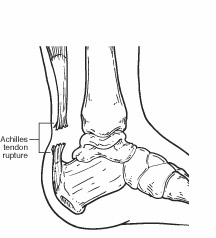 If the Achilles tendon is ruptured, the patient will have less strength in pushing down (as on a gas pedal) and will have difficulty rising on the toes. The diagnosis of an Achilles tendon tear is typically straightforward and can be made through this type of examination. In some cases, however, the surgeon may order an MRI or other advanced imaging tests. Treatment options for an Achilles tendon tear include surgical and nonsurgical approaches. The decision of whether to proceed with surgery or nonsurgical treatment is based on the severity of the rupture and the patient’s health status and activity level. Whether an Achilles tendon tear is treated surgically or non-surgically, physical therapy is an important component of the healing process. Physical therapy involves exercises that strengthen the muscles and improve range of motion in the foot and ankle.